Common Applications for Advanced Heat Pipes | Noren Thermal, Inc.
Heat exchangers today are utilized for a wide variety of different applications, from cooling control panels for manufacturing equipment to transferring waste heat within small, powerful electronic devices. To keep up with different demands, heat exchangers and heat spreaders come in an equally wide variety of types, and heat pipes are among the most versatile of them all. 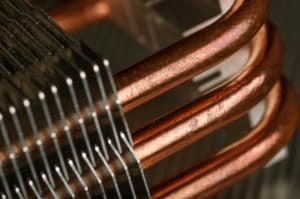 Using two-phase heat transfer techniques, heat pipes not only provide reliable and eco-friendly thermal management, but are also high-performance systems that can be custom-designed to meet the unique needs of most applications. Heat pipes transfer heat through a process a known as phase-change cooling. The fluid within the heat pipe absorbs waste heat, but rather than rising in temperature, the fluid evaporates (changes phase) to accommodate the thermal energy. The gas is transferred to another, sealed-off area of the unit, where the energy is released and the fluid is condensed back into fluid. The process is known as latent heat of vaporization, and allows for the transfer of high levels of waste heat without allowing the temperature inside of the heat spreader (or near sensitive electrical equipment) to rise. Designed by a highly skilled team of technical and engineering experts, Noren’s heat pipes can be an ideal thermal management solution for a wide range of applications. To learn more, call Noren Thermal, Inc. at 866-936-6736. Now located in Taylor, TX, Noren proudly produces all of our products in the United States and delivers them to clients nationwide.